After graduating from Kent State University with a degree in Fashion Design, Alisa worked as a custom bridal gown designer. Working one on one with brides over the past 15 years taught her much about what brides really want in their gowns. Alisa has combined her vintage gown obsession with her knowledge of bride’s needs, and have launched her new line of vintage inspired couture gowns for the modern bride. 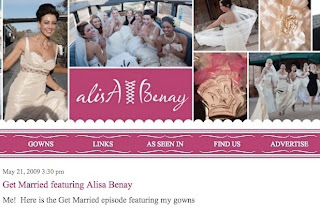 Alisa wanted to feature her bridal gowns in the header, and have an elegant design that matched her main website.